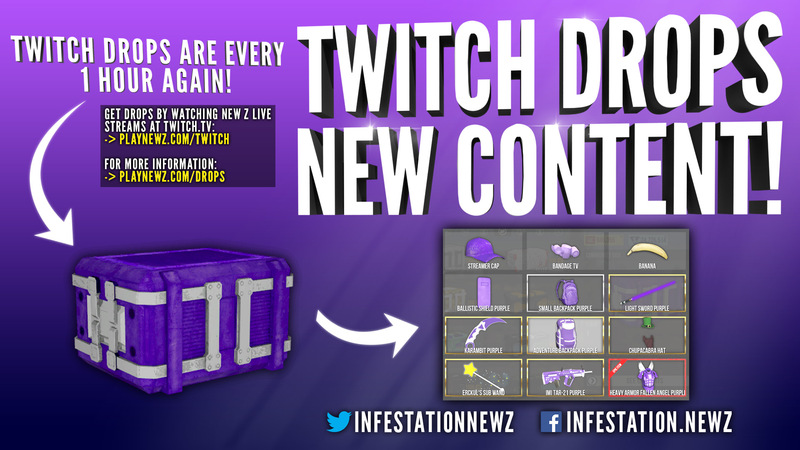 TWITCH DROPS ARE EVERY 1 HOUR AGAIN! ? We have listened to your feedback and reverted back. We have also updated the content! Now; 2 new skins are added (Karambit & Adventure Backpack) AND new / more items are added to the box! Note: you can always see the content of the box LIVE at any time by going to the in-game marketplace, select the community box and click on "see content". I really want that banana. HaHAH of course he is! Anyways, you guys like this change / update? I'd like to see a reverse of PvP server to 20 people / 5clans players & also old srpead T_T random spread make no sense on an arcade game..
Good idea! BTW I have read your post earlier about this as well and wanted to say thanks for that! Either way lets see where this change goes and in some time we can re-look at it again and update if needed! Thats the numbers since the introduction. I upped the sample size per day so it should be more exact. With the content we'd like to aim: Leave it like this for now, and in a few weeks add some new stuff / remove some old stuff to keep the hype up. Can I ask, where do you make these schemes? What do you use? Also, don't forget that we have not ONLY reverted back to 1 hour, we also added more new and variated and more "worth it" content. I just wrote a smoth little tool that grabs the number of viewers and streamers on twitch 6 times a day and puts it in my database. Hahah allright. If you need anything feel free to send me your Discord I can add you there Thanks for the visualization of the data anyways! @Lauchboy The chart is good but one line struck a nerve with me "Viewer activity (other than stupid giveaways) needs to be brought in. Event map is good! 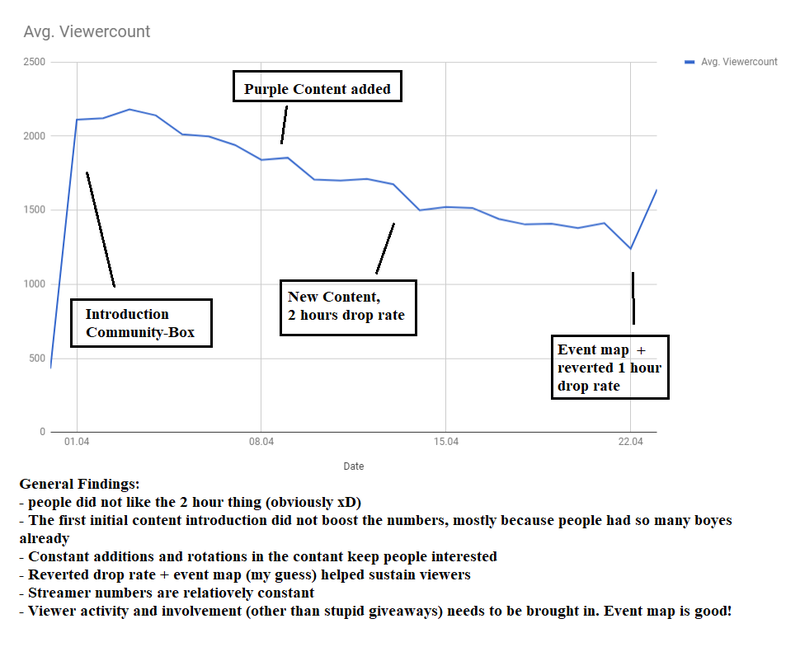 OK for one to say that giveaways are stupid and use event map is good is an oxymoron Events in general are giveaways. I have done 3 maze runs on the new event server with prizes going to the winners and everyone has had a blast doing them. For two I have always given gear and gd away to my viewers because I can and I like to give back to a community that has followed me. Yes I know allot of people only follow streamers to get stuff but they also follow for the entertainment of the stream and in turn end up giving gear to me to give away also. You can ask Fred, Sven, Kaz and Chupa I have never really asked them for anything to be given to me for being a partner with this game heck I am prob. the only streamer partner that does not have a shield with my name on it, do I have a design in mind for one yes but I have not asked for it to be made. Giveaways are not stupid they are just a way to market the game even better, bring in new players and retain viewer ship for streamers. If this offends you in anyway I am sorry but to call a giveaway for people that follow you stupid is offensive to me. should I set up obs studio myself to stream live on twitch? Miranda: Yes you will need to use obs studio or xsplit or another form of broadcasting software. I personally pref. OBS as it is free and works great. There are allot of good videos on how to set it up and use with diff. systems and may take a little time for you to get used to but you cane get it done. There is also a light version from Streamlabs called Streamlabs obs but it is new and does still have some issues but the choice is yours. Happy streaming. Wow ok this was not meant as an offense to you or any streamer. I just generally despise the way twitch works for NewZ right now. Titels usually are something like "Lootboxes here! Skin Giveaways after every death!" and this is how big numbers are generated. Since Twitch is competition and "customers" or in our case viewers have the power, I dont blame streamers to use that tool. And this is mostly to the fact that the player/viewerbase constists of a lot of /borderline_racism_on greedy thai boys /borderline_racism_off. This is a vast geralisation, but it has a kernel of truth to it. To me a long term healthy viewerbase can not be sustained by that greed for items/skins etc. 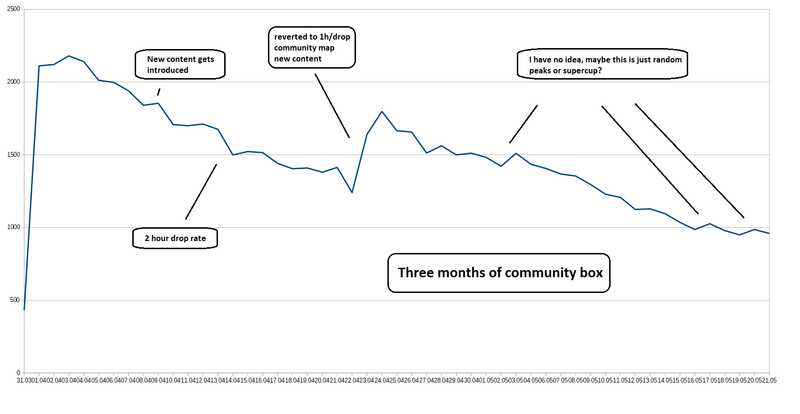 Giveaways and the community box wont keep activity up for ever and should only be used as a jump start. A healthy, fun to play and fun to watch game does. Community interaction does. Maze runs, races, pvp tournaments or all those crazy ideas do. I remember Dakotaz doing a gentlemans mosin fight, typeforced doing cage-firstfights or general streamer motivated events like the introduction of new pvp areas and I even think most streamers do a really good job at trying to do that and I might be a drama queen here. I dont mind giving out gear as a prize either. But damn i am just sick of keyword raffles and especially sick of those where you have to reroll 5 times because the greed-boys are not even active enough to recognize they won. Ultimately what counts from my postig should be the stats I provided anyways. They are objective and absolute. They are what the devs can draw conclusions from. Of course. And once again thanks for your stats! Lauchboy I do want to thank your for the time and effort you put into this post and hope it is useful to the devs. If I came off harsh in my post I am sorry and hope you didn't take offense on any way. That was not my intent.